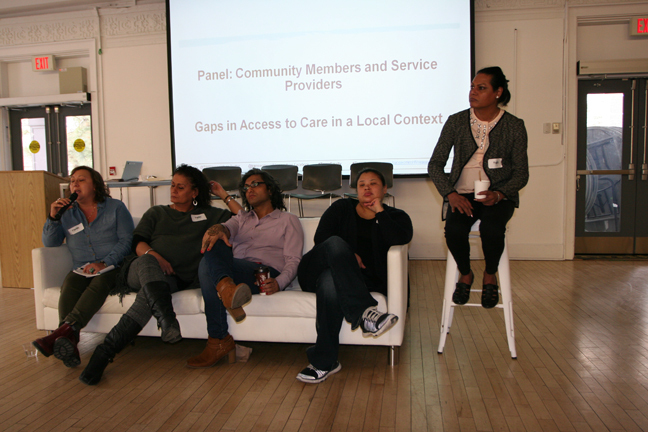 On April 5, the first annual Trans Women and HIV Research Initiative (TWIRI) conference was held at The 519, a community centre that responds to the needs of the LGBTQ community. Over 50 academic experts, service providers, and community members joined together to share data and perspectives regarding the experience of trans women with HIV regarding their access to healthcare and determinants of health. The TWIRI pre-conference gave participants trans 101 training, teaching them the basics of terminology, human rights, and the social realities pertaining to and affecting trans women in Canada. With this knowledge fresh in everyone’s mind, attendees were encouraged to attend the more in-depth event the next day. We were fortunate to have Ms. Yasmeen Persad (the TWIRI coordinator), Dr. Carmen Logie, and Ashley Lacombe Duncan share findings from their research projects, which highlighted some of the strengths and challenges that trans women face and are subjected to in achieving their optimal health. Additionally, a community panel was invaluable in starting important conversations regarding how to best support trans women with HIV and how to be a trans ally. The learning was not one-way, however, as attendees shared their insights and fostered working relationships among one another during more collaborative and interdisciplinary discussions for the last half of the day. Lastly, TWIRI officially launched the TWIRI website, which we are thrilled that you have found!